Once again we converge upon Wyastone for the recording of Piano Sonata No. 8. It is a Saturday afternoon on a quiet M50 towards Monmouth. It is late autumn. The sky is a continuous thick low lying grey cloud which merges with the mist which blankets the surrounding countryside. The fields are supersaturated. Everywhere there are fallen leaves coalescing to make a heavy and lumpen carpet. The last vestiges of the autumn colours show. The world is grey. In the cold and deep darkness of a rural night, Alex arrives, off loads and sets up his recording equipment ready for the following day. Mary arrives much later from London via Abergavenny and promptly soaks up a huge cup of warming tea. The troops are mustered, plans are laid. The following morning we make an early, determined start. There is much to be done. The warmth and brightness of the auditorium make a welcome relief to the ever present pervading cloud and chilling mist. As always there are no problems. Wyastone is ready and waiting for us thanks to the efficiency of Paula and Amy who, throughout the last months, have offered limitless quantities of care and support. This, together with their ever prompt replies to my countless questions and queries has helped to make Wyastone a most pleasant experience for us. Alex finalises his preparations. The mikes are placed in precisely the same position in relation to the Steinway as they were in September. Mary is limbering up at the keyboard. The stage lights form bright scintillations as they are reflected in the polished black wood of the piano. The auditorium becomes energised. Alex fiddles and twiddles, adjusts, taps keyboards, goes through his sound checks. “Ready?” from Alex over the intercom. A nod from a poised and distant figure dwarfed against the proximity of a huge Steinway. Immediately there is a familiar tension as the recording begins. In the control room Alex crouches over the score and meticulously makes the first of hundreds of notes. Take after take. We slowly progress towards the best possible outcome. Hours creeping by until we take our first break to allow the piano whisperer, the ever reliable and dedicated Phil, access to the piano for the second tuning of the day. In the afternoon work proceeds in our giant insulated brick bubble. We are self-contained and self-sufficient. The outside world a million miles away, forgotten. Mary working with consummate skill never faltering, ever enthusiastic in the search for near perfection. Alex listening with his incredible acute forensic senses. Me walking the length of the auditorium after each take to discuss and share with Mary ideas and possible alternative approaches. Complex webs of annotation spread across the 8 or 9 sheets of music attached to a huge cardboard music stand before her. The last section proves elusive. Mary is almost running on empty but after a further discussion, a shuffle of the pages, a re-ordering, we find a solution. There is one last effort, one last take, another wonderful performance and we are finished. We have completed almost one hour of recording in just one day. 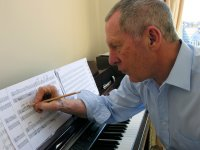 Peter Vodden was studying the score to TWELVE – however he was not perceiving it as music. He was recognising it as a stream of data superimposed on a grid or matrix. There was a long studied silence, and then, “I think that I would like to try something with this” and off he went to his favourite place, his shed, his digital greenhouse. Great expectations had I none. As creative as Peter is (to discover how creative visit his website petervodden.wordpress.com) one cannot expect a person who has “little in the way of traditional music knowledge or training” – Peter is given to understatement – to produce, at a first attempt, a mature piece, a piece which exhibits high levels of musical integrity and artistic value, a piece which has a beguiling sense of flow and continuity. Well, that is just what he did. After only two or three weeks I was listening to Peter’s electro-acoustic debut. I liked it immediately and, after many repeated listenings, I still do. It does not pall. I am most pleased to include his realisation of TWELVE on my Performances page. On Peter’s website you can find a more technical explanation of how the piece was constructed. Since then I have given Peter, at his request, several High Order Non-Prescriptive scores and he has successfully composed realisations of each.